College Misery: It Is I, Yaro, With the Misery. On the Priorities of My Young Charges. It Is I, Yaro, With the Misery. On the Priorities of My Young Charges. I am fond of them. I hope that if I have proven anything in the variety of messages I have posted on this site, it is that I am fond of the young people who come to share the term with me and my husky smorgasbord of educational delights. Yet, I have found in recent years that their priorities have changed. "Yaro," they might say, "I have only now just learned that my family desires to fly me and my elder sister to a vacation spot near a sunny beach. I am unable to spend the next week working on the project. I know you would not wish for me to miss this outing." Well, that is not true, in fact. On the contrary. I wish my student would have instead told his or her parents that indeed the college was still in session, that in fact what they were paying for was for us to be open, for all of my colleagues to make our way to the large buildings each day, to continue to press forward, to offer up our lesson plans, the projects and essays and assignments designed specifically for these same students who would seem to prefer a sunny clime to a wintry blast of our college's finest instruction. There is another group of young people who fancy their lives have high dramatic qualities that require a focused attention that sublimates every other non-essential activity, say, a meeting with me and the other students. "Dr. Yaro," they will report - breathlessly, "My cousin Thanatos just telephoned me from Denver. There, it appears, has been a rather heated argument with my Aunt Sophia. A credit card has come up missing, and my poor cousin is afraid that his mother suspects him of using it for a long evening of debauchery and then disabusing himself of the card. My family often turns to me in cases like this. I would hate for the dispute to escalate, and therefore, after my shift at the Carl's Jr. this afternoon, I am going to endeavour to catch a ride with my friend Cieros, who has a car and the newest Arcade Fire compact disc. I knew you would not want me to come to class when I am as jangly and distracted with my family emergency." Well, of course, that is all wrong as well, as is the notion that many of my students like to assume things about what I would or would not prefer regarding attending my class, how one might turn in a project, and so on. One young lady told me last week, "Professor Yaro, the road of egress near my apartment complex was flecked and shiny with a coating of ice and snowpack. I knew that you would not want me to take any unnecessary risks in attempting to drive to campus. Therefore, I would like to now take the quiz that you offered that day at my leisure. I believe there is plenty of space at the coffee bar across campus where I might complete the task." Well, no, that's again not something I would have signed off on. And then there is another class of student who seems especially prone to injury and/or disease. I have not spent much time in our college's dormitories, but I imagine they must be quite unclean and dangerous places, for my students are forever contracting bacterial and viral delights of a wicked variety, or crashing headlong down unlit stairwells, or causing rapidly combusting blazes while attempting to cook on improvised heating plates and irregular and large toaster ovens. "Dr. Yaro," one might say, "I have stephococylis, and require that any and all notes that you might be distributing in class come to my campus email instead. I would love to come to class, but the ointment and medications I have make me feel as though there is a film over my eyes, and my feet feel as though connected to someone else's legs. I contracted this virus while sliding barefoot down a plastic ramp my roommates and I fashioned out of the lid of a broken trash dumpster." 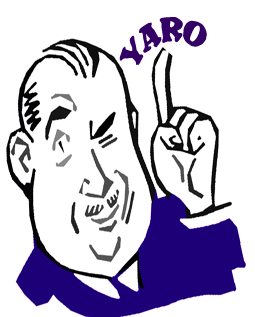 "Yaro," I might hear over my office telephone. "It is I, Nikolos. In the early morning hours, I unfortunately jammed my thumb while attempting to jump through a half-ope window at the Gamma Phi house. My roommate helped me clean the glass from the wound, and I have since attached a large gauze pad to the affected area. Yet, the discomfort continues to this moment, and once I am done typing up my History paper for Dr. Mikopulus, I believe I will give myself a well deserved break from my college activities. I know that you would not want me to sit and squirm in class, what with the painful injury." And they are all wrong. Each of them has assumed that I, Yaro, too, place their college progress rather lowly on a slippery scale of the college student's list of priorities. In truth, I believe that my class - and the classes of my colleagues - should be the priority. I pray that you will not judge me too harshly for this admission, as antiquated might be its notion in the modern academy. I would hate for the dispute to escalate, and therefore, after my shift at the Carl's Jr. this afternoon, I am going to endeavour to catch a ride with my friend Cieros, who has a car and the newest Arcade Fire compact disc. The above line is the funniest thing I've read all week. Huzzah, Yaro! When I see the big Yaro avatar, I close my office door, replenish my beverage, and settle in. He never disappoints. I have not spent much time in our college's dormitories, but I imagine they must be quite unclean and dangerous places, for my students are forever contracting bacterial and viral delights of a wicked variety, or crashing headlong down unlit stairwells, or causing rapidly combusting blazes while attempting to cook on improvised heating plates and irregular and large toaster ovens. While the truths of which you speak are poignant and dare I, Aware and/or Scared, say universal, would you, Yaro, be able to condense them to 140 characters or less? I fear that Thanatos' cousin, et al, are unlikely, nay, unABLE to comprehend anything more complex than a Tweet. Thank you for taking my mind off of these infernal miniature baskets for a moment. I have just read the entire Yaro catalog...and I celebrate it all. And do his students all really talk like him? Brilliant. Thank you Yaro, for making my day. No, Yaro; it is I who am yours. Why does everyone at Yaro's school have "Greek Sounding" names? I imagine the Greeks did value higher education, but this seems odd. Yaro, loved the post. I laughed the most over the unlit stairwells and the heating plates. So, Yaro, how does it feel to be CM's Studmuffin? Wonderful! I am somewhat relieved to know that Yaro, too, can be perturbed by the same phenomena we mere mortal proffies encounter in our academic rounds. I really don't know what it is with youngsters these days. In my day, college students tried to think up excuses *not* to vacation with their parents, and those with dysfunctional families saw college as a chance to escape. I'm inclined to see a trend toward more (functional) family togetherness as positive, or at least neutral, but haven't these people noticed that most colleges post academic calendars that reach 2,3, even 4 years into the future? As I write, sophomores at my institution (and their parents) could, if they so desired, look up their graduation date (well, their expected graduation date, but if history is any guide, any changes are far more likely to be precipitated by the student's actions than by the university's). Here's what I love about CM...the idea that all of you could conceivably be my colleagues some day. Could you imagine how much fun the job would be if Yaro was down the hallway, and Strelnikov was down in his bunker in the basement, and Motor City Mitch was in the administration building? It would be heaven, pure and simple. I would settle for ONE lively colleague in my department, just one. I wish I knew if I was the only one at my college reading this site. In agreement with Reg W and Reynolds. I love, you Yaro. Be my valentine. Stella, you beat me to the punch! But I know I've read of a Mrs. Yaro before. Lucky girl! Yes, read this ... foiled! When I stop loving them, truly respecting them, their goals, their sometimes even hidden and unknown desire to crest understanding and creative thought, then I will know that it is time for me, Yaro, to ply another trade, or perhaps just skedaddle myself, Mrs. Yaro along, of course, as she is never far from my side, my mind, or my heart. Yes, Yaro is, I'm sure, faithful to Mrs. Yaro, as to his students, whatever their foibles. But we can love him platonically, as the honorary grandfather of the blog, no? I, too, would love to see a CM university. I suspect we'd all turn out to be all too human at close quarters (what can I say? I come from a Calvinist tradition), but it's still a lively, smart, and, despite our complaints, truly dedicated bunch (those who don't care don't complain/critique). BlackDog once made mention of setting up a cardboard-shack university. Might be worth a try, if we could find a temperate climate. Or maybe we could just stage a mass takeover of one of the cardboard-shack charity/protest villages that, at least at my university, pop up on the commons every spring (in my undergrad days, the message was anti-apartheid; these days, it seems to be Greek organizations fighting homelessness)? I find it distressing that Yaro's students focus only on the good of the few rather than that of the many. My own are more altruistic: "I stayed home from class today to spare my fellow students the agony of suffering through the deeply contagious ebola I've mysteriously contracted," or "since a freak boating accident last weekend resulted in both of my legs being replaced by tank treads, I decided to stay in today rather than leave a trail of bodies in my wake" or "I overslept today and could have made it to class, but deemed it too risky as my lingering slothfulness may have threatened to put my classmates into a similar stupor." It's good to see that they have everyone's best interests in mind. Much like ELS, I, too, settle in with a closed door to read your posts. O Yaro, nobody writes like you. Every post by Yaro makes me smile. And I am charmed by the idea of CM University. @Froderick: In my imagination, Yaro, when he feels the urge, indulges in a thimbleful of some rare, exotic, and quite potent form of alcohol (probably of Mediterranean or Eastern European origin), maybe following a glass of wine at dinner. But what do I know? Maybe he's into (and/or the product of) Ecstasy, or 'shrooms, or LSD, or something along those lines. Maybe vintage '60s LSD, stashed away in the attic of the rambling, badly-insulated home he described in his last post, and taken a few hours before his appearances here? Or does that stuff keep? Your post was, as always, delightful and entertaining. It's the ending, though ("In truth, I believe that my class - and the classes of my colleagues - should be the priority.") that is the salient point. They do not prioritize their education, and it is heartbreaking. There is no shame in admitting that this gets to you. I'm with you on this. I have to fight the resentment that comes with working exponentially harder on their behalf than they do for themselves. They are eager to impart their reasons for missing class or not doing the work, and the bottom line is that I just don't care about the minor crap they put ahead of the work they should be doing for their classes. I understand and sympathize with the major stuff. Sadly, people do become ill. Their children or parents or spouses become ill. Their lives fall apart in unimaginable and heartbreaking ways. People die. But the other things? I have zero patience for it, and I'm afraid that I'm much more blunt than you are. I'm not unkind, but I do remind them that they have signed up for these classes of their own volition, that they have responsibilities that they have agreed to meet by registering for these classes. I try to remind them that education matters. In fact, I beg them to see that. It's wearisome. It's okay to vent.